So I've been buying (way too much--ask my husband) Munki Munki jersey lately, because sadly, that's all that's really available right now. :( And what else is jersey good for besides, um, pajamas!!?? (other ideas, anyone?!) So here's what I'm sure will be the first of MANY pair of summer PJ's for the boys. I used the Fireflies fabric ("always remember to set the fireflies free"), which I adore. 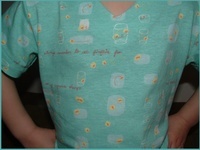 I'm a little bummed that from a distance, it kind of looks like my kid is wearing hospital scrubs. Oh well. It's a Butterick pattern, and it called for velcro (velcro? Ick!) on the neck, so I substituted that with snaps. 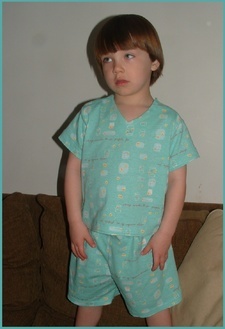 Here's the big kid in his new jammies (and a closeup of the fabulous fabric!). Two seconds earlier he was jumping up and down with excitement about his new pajamas, so I have no idea what this face is for, but the battery ran out on my camera right after this pic, so this is what I got!